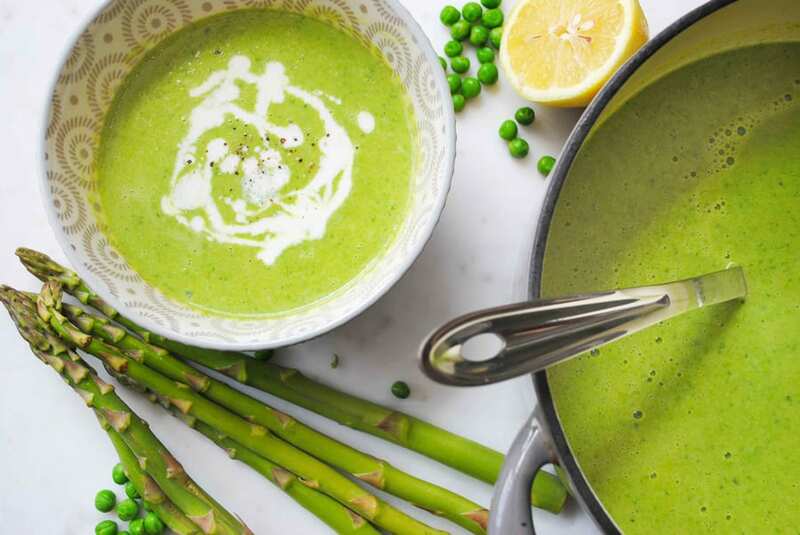 A simple broth is made by simmering the stems of fresh herbs and onion then the asparagus, peas, lemon zest and herbs are blended together with the homemade broth to make an intensely satisfying soup that is perfect for lunch or dinner. 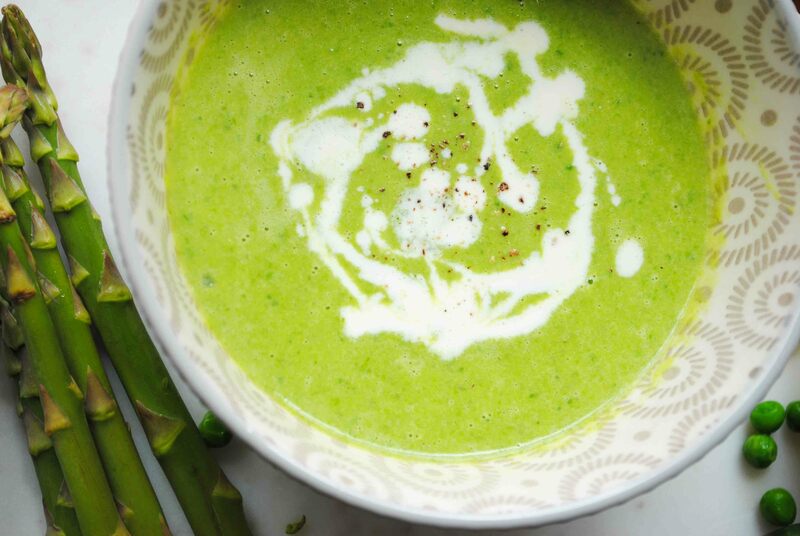 Green Asparagus & Herb Soup is wonderful hot or chilled. I usually prefer to serve it warm for dinner with a side salad and crusty bread, or chilled for a refreshing lunch. If you can’t find creme fraiche, fear not. You can easily substitute heavy cream for the 1/4 C you need in the soup. Or you can easily make your own at home. I actually prefer to make my own, it’s easy and inexpensive. Just mix 1 C heavy cream with 3 tbsp buttermilk. Cover the bowl with plastic wrap and allow it to sit on the counter overnight. It will become thick and creamy. Store the homemade creme fraiche in the fridge to dollop on your soup. This is one of the few soups where I prefer to blend it in a blender or food processor over using an immersion blender. (Check out my Tips & Tools page for recommendations on which models I prefer.) You want a REALLY creamy consistency and I lack the patience to immersion blend for that long. But feel free to do either. If you do blend it, do it in small batches and place a hand towel over the lid as the hot steam can make the soup splatter and get messy. I usually allow the soup to cool for about ten minutes before blending, although this step isn’t necessary. 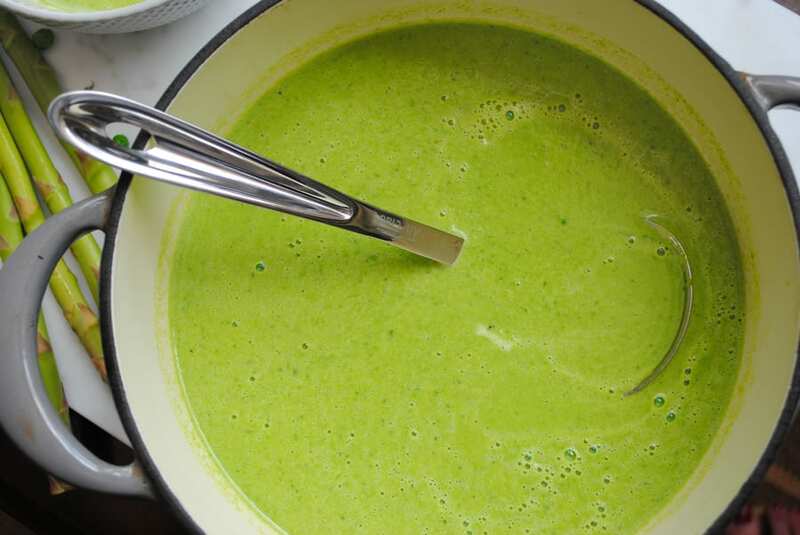 The recipe for this Green Asparagus & Herb Soup was adapted from Julia Turshen‘s recipe for Spring Pea, Leek, & Herb Soup from her cookbook Small Victories. Julia’s method of using water as a main ingredient was somehow revolutionary to me. 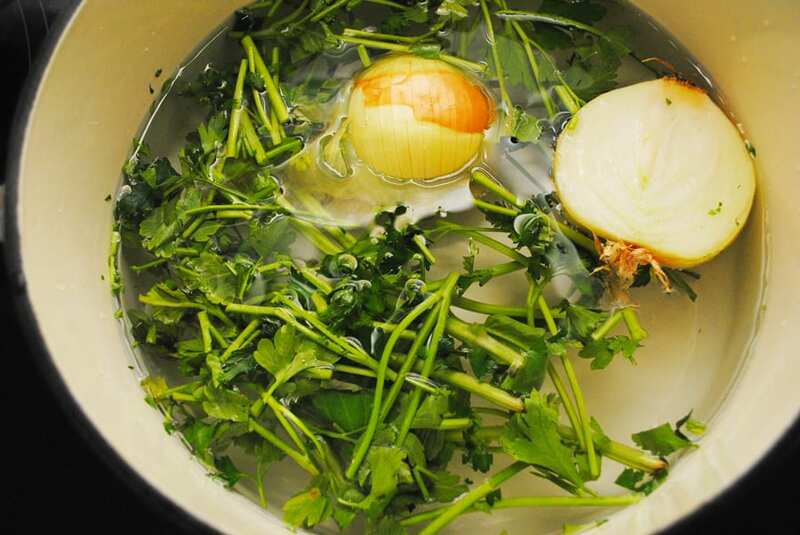 I usually almost always use stocks for soups, and this method of making a light broth with kitchen scraps was genius. If you haven’t checked out her cookbook Small Victories, you really should. It’s one of my favorites. Her recipes are easy, simple and delicious, but not mundane. She teaches new methods, new ingredients you may never have tried before, and offers several variations on each recipe. Her food is very much like Ina Garten, another food inspiration for me. In fact Ina writes the foreword in Julia’s cookbook. This recipe was adapted and inspired by Julia Turshen's recipe for Spring Pea, Leek & Herb Soup from her cookbook Small Victories. Bring 1 onion, cut in half, skin and stems still on to a boil in a small dutch oven with stems of parsley, stems of basil, 1 1/2 tsp kosher salt and 6 cups water. Gently simmer for 30-45 minutes. Strain the liquid into a bowl with a mesh strainer over the top to catch the spent onion and herbs. Set the bowl aside. Keep the broth but discard the items in the strainer. Wipe the pot clean. Put it over medium heat and melt the butter. Add the other onion, diced, and the asparagus, cut into 1 inch pieces. Sprinkle with 1/4 tsp kosher salt and saute for 5-8 minutes until onion is soft and asparagus is still bright green. Add broth back to the pot along with the peas, lemon zest, and basil leaves. Pull the pot off the heat and mix in the creme fraiche. Allow to cool for 10 minutes. Blend in a blender or food processor 1/3 of the soup at a time, making sure to place a hand towel over the lid to ensure nothing splatters out. Transfer to a serving bowl and serve warm or chill for at least 4 hours. Serve as is with cream fraiche dolloped over the top, or drizzled with a little olive oil and crack of black pepper.